We have all heard of a Netbook as well as Notebook. Before we get into the difference between them both, let us see what exactly is a Netbook and a Notebook. Notebook: Notebook is a term used for portable computer, sometimes interchangeably in place of a laptop. However it is thinner and lighter and has a better battery life than a laptop. Netbook: Netbook is a small version of a Notebook, which is used mainly for travelling purposes. Besides this one liner definition for each of them, we will understand them better once we see the difference in their functionality and architecture. So, what really makes them different? Here are a few points listed that would clear how a Netbook is different from a Notebook. 1. 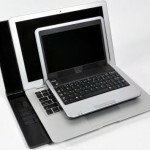 The screen size for Netbook is between 7 and 10 inches and the screen size for Notebook is between 10 and 17 inches. So the Notebook is bigger in size, while the portability of Netbook is better since it is lighter in weight. 2. A Netbook does not have an additional Storage Drive but instead has ports so that external drives can be used along with it and a Notebook has all the inbuilt drives as present in a Desktop. 3. A Netbook, because of limited features, is less expensive than a Notebook. A Netbook is used mainly for surfing the net and using basic computer accessories, while a Notebook is used for all functions since they are equipped with powerful processors and a better resolution than a Netbook. 4. With respect to processor Netbook uses a processor that would use less power like Intel Atom Processor, and since the processor would have less speed, as the hardware is less there, the battery stands for a longer duration. The battery can continue for as long as 10 to 12 hours without charging intermittently. On the contrary, a Notebook uses either Intel or AMD processors and works well since it has a large hard drive and can handle the power used by the same. In Notebooks, the battery drains much faster since they have a larger screen size.